It has been less than a year since I first met my traveling companion, but in many ways it seems like so much longer. When I think of all the places I have been since then, I can hardly believe it. I have to say that when he invited me to travel with him, I was not at all certain. I told him I didn’t like the idea of not having a home, but he assured me that I would have a home in Canada, and many close friends to be with when I wasn’t traveling. I was still nervous. I asked my traveling companion many questions about Canada. If it was going to become my new home, I had to be certain that I could be happy there. I knew very little about Canada, and bears have special needs. I have a very warm coat, and there is not any easy way to take it off, so I was worried that Canada might be too hot. He laughed at that, and assured me this would not be a problem. When winter came, he thought I would find my warm coat very useful. He told me that parts of Canada had many months of snow and ice. If I hadn’t already had a warm coat, we would have had to buy one for me. I got excited at the idea of living somewhere with lots of snow and ice. Some bears don’t like the snow, and will actually sleep all winter long. I laughed when I was told that, because I am definitely not one of those bears. I love the snow. I love to play in it, to roll in it, and to get all covered in it. It is great fun. Of course, Switzerland has snow too, but mainly in the mountains. In Geneva we had some snow, but not nearly enough to make me happy. My traveling companion told me that in Ottawa, they had lots of snow right in the city. In fact, it gets so cold that the canal freezes solid, and people can actually go skating for miles outdoors, right in the middle of the city. I think that was the moment when I actually decided to join my traveling companion on his travels, though I did ask many more questions before I gave my official answer. 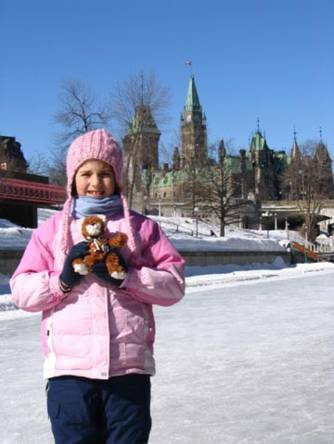 I have had a wonderful time traveling around the world, but one of the things I’ve always been looking forward to the most was the chance to go skating on the canal in Ottawa. Unfortunately it was quite warm this winter, and the canal didn’t open before I began traveling again after Christmas. I wasn’t worried though, because I knew I would be in Ottawa all of February. Then I had the most wonderful invitation to go to the Winter Olympics in Torino, Italy. Of course, I had to say yes, but part of me was sad because I knew the canal would certainly be closed by the time I returned from Italy. As you know, I did go to the Olympics, and had an absolutely wonderful time with my special traveling companion. After all of the medals and the closing ceremonies, we flew back to Canada to visit again with my wonderful friends in grade 3. It is always nice to travel, but it is even better to be back home with good friends. When I saw my usual traveling companion, I gave him a big bear hug, taking care not to stick out my claws, of course. After I’d finished telling him all about my trip to the Olympics, he told me that he had a surprise for me. I love surprises, so I looked around to see if I could spot it, but everything looked normal. Then my traveling companion told me that the weather had turned colder, and the canal was still open. When I had decided to go to the Olympics, I had told myself I would have to wait another year to go skating on the canal. Then, I’d had such a wonderful time in Torino that I had completely forgotten about the canal. Now, it looked like I was going to be able to go skating this year after all. My traveling companion looked at me, and asked me if I wanted to go? Duhhh! We decided we really should go early, so that the ice would still be good. The nice sunny March days may be pleasant for people, but for bears with warm fur coats, and for ice, they are not ideal. Bears never sleep in, so I was up with the sun and ready to get going. Finally at 8:00 AM, I couldn’t wait any longer. I went into my traveling companion’s room and yelled as loud as I could “get up you sleepy-head”. When I threatened to throw cold water on his head, he finally got out of bed. That is how I found myself skating on the canal in Ottawa, on a sunny March morning. With my pins, and stories, from the Olympics, I had no trouble making new friends. 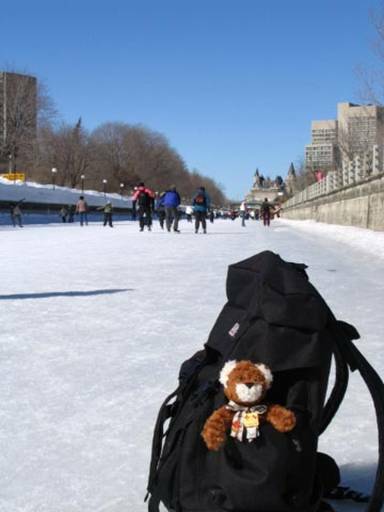 My traveling companion showed me that you could see the Canadian Parliament buildings from the canal. It was sort of neat, but I told him that we should save that for another trip. I wanted to get skating. But I did take the time to take a picture with one of my new friends. When my traveling companion said we could go skating, I immediately went to my room to look for my skates. Most bears don’t know how to skate, but as you know, I am not like most bears. Still, my traveling companion suggested that perhaps this first time, I should let him do the skating, and just enjoy the ride. I wasn’t convinced, but I decided not to make a fuss, and let him put me in a special pocket on his backpack where I could see everything around me. It was fantastic. I was able to wave at all the people skating on the canal, and show them thewonderful pins I got at the Olympics. I was surprised at just how many people there were skating on the canal. I’ll bet there were over 1000 people there. Unfortunately I didn’t see a single bear, but I suppose that is because most bears don’t like to skate. My traveling companion had told me that skating was fun, but there was another reason to go on the canal. He said there was a wonderful tasty treat called Beaver Tails. I gave him one of my strange looks when he said that. At first I though he was joking, but he assured me he was serious. So many things about people confuse me, you’d think I’d be used to it by now, but this just didn’t make sense. I didn’t think people ate beavers, and I just couldn’t imagine eating their tails. It just didn't sound appetizing, no matter how much my traveling companion insisted. In the end, I just nodded and changed the subject. I had completely forgotten about the Beaver Tails until my traveling companion mentioned them while we were skating. I told him that I really wasn’t all that interested, but he could go ahead if he wanted. He asked if I was sure. Of course I was sure. 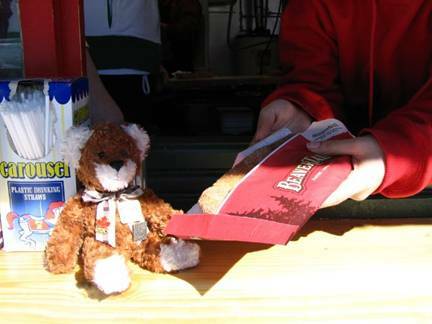 When he went to the stand to order a Beaver Tail, I realized this was another one of those strange human things. There were no beavers anywhere to be seen. Then I saw what the Beaver Tails looked like, and I told my traveling companion that I had changed my mind. He just smiled, and didn’t seem surprised at all. 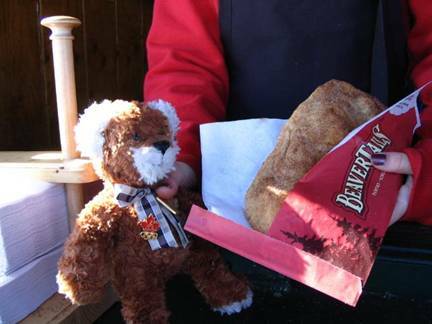 When I had my first taste of the Beaver Tail, I thought I was in heaven. You may have heard that bears are very fond of sweet things. That is one way that I am like all other bears. I sat in my special pocket and ate every last bite. When I was done, I asked if I could have another one. My traveling companion was a little surprised I could eat that much, but he was kind enough to get me another one anyway. It tasted even better than the first one. Yummmm. After eating our Beaver Tails, we had lots of energy for our skate. I was busy watching the people, so I didn’t really notice where we were. Suddenly my traveling companion said it was the end. I was disappointed. Then he said that it was time to turn back. I had thought we were finished skating, but he had meant we were at the end of the canal, and it was time to skate back. Suddenly I was very glad I had decided to ride instead of skate. I found out later that we had been skating for almost 8 kilometers, and now we had to skate the same distance to get back! When we arrived back at the beginning, I noticed something that looked like a swan made of ice. I asked my traveling companion what it was, and he said it was an ice sculpture. I asked if we could have a look, and he took me up to see it. I even went for another ride, though I think a real live swan would have been more exciting. 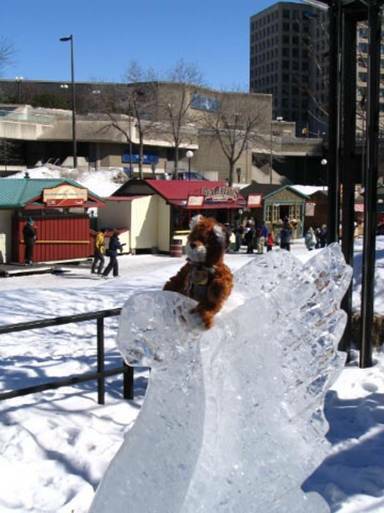 After my ice-swan ride, it was time to head back to Stittsville. I was tired, but I’d had another excellent adventure, and couldn't wait to tell my grade 3 friends all about it. I wonder where my next adventure will be?